The Embark Package: Executive Journey is for the passionate, purpose-led and aspiring corporate leader, manager or specialist who is all in and on a career progression track. You want to explore your personal brand, clarify your most compelling natural strengths and pursue a fulfilling role within an organization. You need guidance, strategy and the tools to get there. With this full-service personal branding, creative services and strategic planning package, you get everything offered with the Explore & Chart Package, plus the final 3 steps of HerNature Method Map—Craft Your Story, Map Your Strategy and Start Your Quest. From a professional digital portfolio with a polished and modern resume, bio and social media presence to ongoing strategic guidance for your job search, promotion or salary negotiation, you’ll have all the visual and written content and career resources you need to feel confident and calm in mastering your journey. Want to learn more about HerNature process? 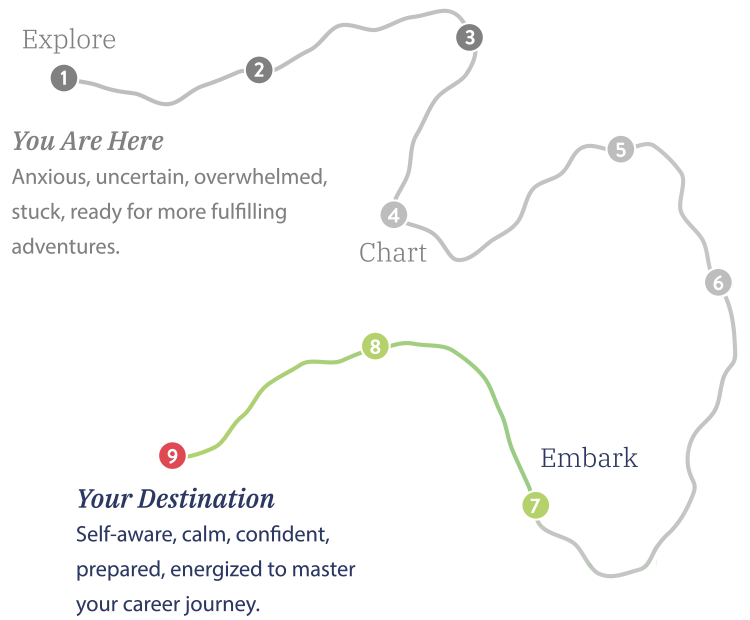 Explore our Method Map to see how your journey unfolds. To get in on the Embark Package: Executive Journey: Select a date and time below for your kickoff session with Carole. Enter your information. Purchase the package. And you're all set. Want more details about this package? Still unsure which package is right for you? Schedule a Free 30-Minute Consultation with Carole.